Every year, 17.1 million lives are claimed by the global burden of heart disease and stroke. By 2020, the World Health Organization (WHO) estimates nearly 25 million cardiovascular disease (CVD) deaths worldwide. This noncommunicable disease is emerging as major causes of death in India. Estimate by WHO indicates that 50% of death and disability from CVD can be reduced by a combination for simple effective national efforts and individual actions to reduce major risk factors. The traditional approaches for diagnosis of the disease is by monitoring of biochemcial markers like total cholesterol (TC), high-density lipoprotein (HDL), low-density lipoprotein (LDL), triglycerides, or by in vivo techniques like ultrasound, magnetic resonance imaging, or computed tomography. Atherosclerosis is the major cause of CVD,  where the disturbances to blood flow causes temperature variation in skin surface. Blood parameters that are involved in lipid metabolism are HDL and LDL. The important role of HDL is to aid in uptake of cholesterol from peripheral tissues to liver through the reverse cholesterol transport. Thus antiatherogenic mechanism of HDL which removes excess of cholesterol from blood vessel wall prevents the stenosis of blood vessel due to atherosclerosis, specifically in the peripheral vessels. Hence, low level of HDL (<40 mg/dl) is strongly associated with an increased risk of CVD. , This vascular dysfunction alters the skin temperature making temperature as an important indicator of health. Thermal imaging is one of the methods involving nonionizing radiation, which can be used for diagnosis of CVD. Ultrasound Doppler measurement, one of the techniques for diagnosis of plaque is more operator dependent and accurate measurements are possible only if blood vessel is perpendicular to the transducer. 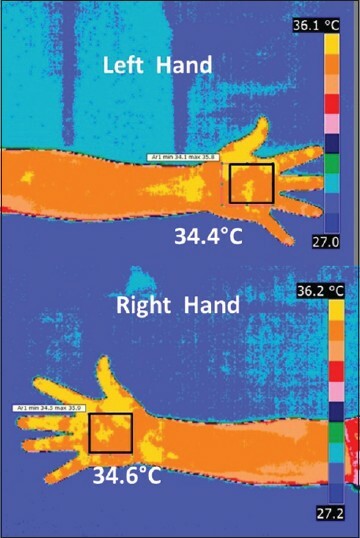 Thermal imaging is a cost-effective tool, which can be used to analyze the physiological function. It is based on nonionizing radiations with sensitivity of 0.05°C. Invasive noncontact thermography has emerged as a useful tool in elaborating the pathophysiologic features of atherosclerosis and other related diagnosis like deep vein thrombosis. Hence, this study was carried out as preliminary study to establish the correlation between the CVD biochemical markers and the surface temperature of the human body. The human thermal system maintains a core body temperature of 36.7°C. Any deviation from this causes considerable discomfort. The heat generated by metabolic activities is conducted through bone, tissue, and skin. The large arteries and veins also play a major role in transferring the temperature to maintain thermal comfort of the human system. Atherosclerosis, the major cause of CVD is a chronic inflammatory condition of the blood vessel wall. The asymptomatic atherosclerosis causes variation in blood supply and thereby affects the surface temperature pattern. Ley and Kim  have demonstrated that there is a hotspot at the site of atherosclerotic lesion. Yu et al.,  have demonstrated that rise in temperature has been observed at the sight of inflammation in arteries of rabbit, which leads to change in temperature pattern. The authors have proved that the difference in temperature has been observed even before there is no clinical sign of inflammation. The intimal surface temperature has been correlated with increase in cell density as atherosclerotic progresses. Hence, IR-based measurements were proposed by Honda et al.,  for vascular studies. Using thermal imaging for face recognition application is based on the fact that thermal image has the ability to capture the superficial blood vessel patterns very effectively. Thus, the surface temperature of the skin can be a good indicator of health. A free screening camp for CVD was organized at a private hospital during March 2010 and a subsequent medical camp in May 2011. Out of the 150 registered participants, 80 were recruited for the study. A total of 80 subjects, aged above 25-70 years participated in the study. The core temperature of all the subjects was measured using thermometer. Any known cases of fever, neurological disorders, diabetes mellitus, thyroid abnormalities, and nephropathy were excluded from the study. A detailed questionnaire prepared for the study was used to evaluate the health status of the subjects, participated in the camp. An informed consent form was obtained from all the subjects. This clinical trial was also registered in the Clinical Trial Registry of India (Ref. No: REF/2012/06/003696). The anthropometric measures like body weight, body height, blood pressure, and waist and hip circumference were measured in each one of the subject. Blood samples were taken in all subjects (N = 80) in nonfasting condition. The following parameters: i) TC (mg/dl), ii) HDL (mg/dl), and iii) HbA 1 c (%) were measured for each subject according to the standard biochemical analysis. Group-II: Normal: N = 21, M/F = 12/9, mean (± SD) age = 53 (± 10.27) years. Subjects with normal levels of HDL and TC. Framingham cardiovascular risk score (2008) is an algorithm based on the Framingham Heart Study for determining individual's CVD risk. , For each patient in the study population, the Framingham general cardiovascular 10-year risk score based on the Framingham Heart Study was computed using his/her age, gender, smoking habit, TC, and HDL values to ensure the severity of the disease in the study population selected. The score for normal group (10.2%) falls into low risk category, whereas, CVD group is at an intermediate risk (17.9%). 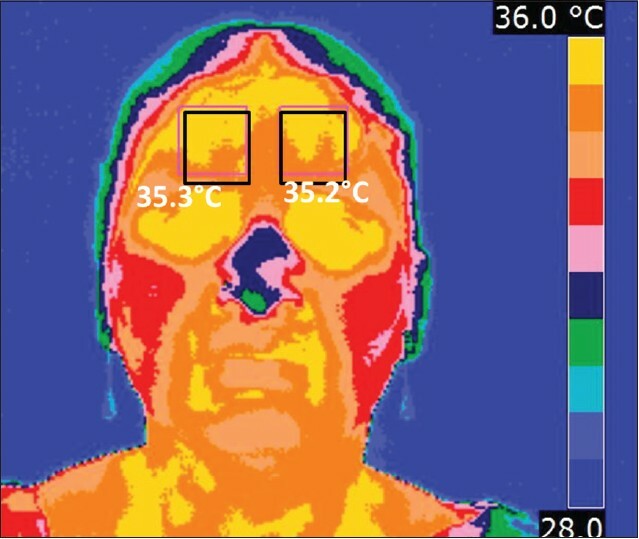 A systematic protocol as proposed by the International Association of Certified Thermographers was maintained for capturing the thermal images  The clinical trial was conducted in special metabolic clinical trial ward constructed under Good Clinical Practice regulation, where the room temperature was maintained at 20°C. All the subjects were made to sit for 15 min in the temperature-controlled waiting room. This reduces the effect of an environment temperature on the skin. The subjects were then asked to stand in the image capturing room uncovered below knee, no metal ornaments of any kind in hand or face. The relative humidity was 50% and emissivity was set at 0.98. The trial was conducted for a period of a week in the forenoon session only, to avoid the effect of cyclic variations in the atmospheric temperature in the study. An IR camera (Therma Cam T400, FLIR Systems, USA) was used to acquire thermal image of the following parts of the whole body in each subject under standard conditions: i) temporal (left and right), ii) neck lateral (left and right), iii) upper and lower arm (left and right), iv) leg (left and right), and v) foot (left and right). FLIR T400 IR camera has an option of internal calibration that can be performed when needed. The camera calibration program uses temperature references that are calibrated annually and traceable to the National Institute of Standards of Testing. The distance between camera and subject was kept 50 cm constant. All the subjects underwent single imaging session. The images were stored and then analyzed offline using the software FLIR Quick report, version-1.2. A series of 14 region of interest (ROI) were selected using automated area tool in FLIR. Maximum area was selected in all the regions avoiding the background. The rectangle select tool available with the software was used and care taken to have an almost uniform area while selecting the ROI for measurement. The average temperature displayed by the software was considered for analysis. The normalization of the data was checked using the Shapiro-Wilk test which gave a greater significance value (P > 0.05). Pearson's correlation analysis was done between the biochemical parameters and the average temperatures measured in various regions of the total populations. Independent Student's t-test was employed to compare the mean of the biochemical parameters and the average temperatures measured among the groups. The contribution of the temperatures predicting noninvasively TC and HDL values were tested by performing multiple regression analysis. All the tests were carried out by Statistical Package for Social Sciences (SPSS) software, version 17.0 (SPSS Inc, Chicago, Illinois). In total population (N = 37), the measured TC (mg/dl) was found to be correlated with the measured surface temperature of the following parts of the whole-body: i) temporal left (r = −0.316, P < 0.05), ii) temporal right (r = −0.417, P < 0.05), iii) neck left (r = 0.347, P < 0.05), iv) neck right (r = −0.410, P < 0.05), and v) hand left (r = 0.387, P < 0.05). 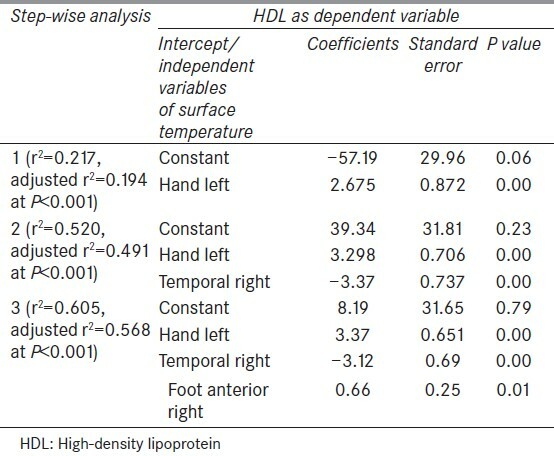 Further measured HDL (mg/dl) was found to be correlated with measured surface temperature of the following parts of the whole body: i) Temporal left (r = 0.445, P < 0.05); ii) temporal right (r = 0.458, P < 0.05); iii) hand left (r = −0.470, P < 0.05), iv) foot anterior left (r = −0.332, P < 0.05), and v) foot anterior right (r = −0.336, P < 0.05). 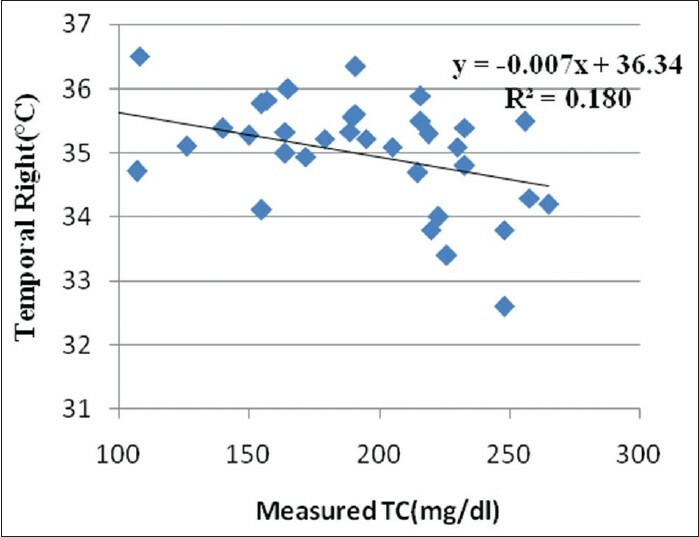 [Figure 1] and [Figure 2] shows the correlation of TC with temporal right temperature and HDL with hand left temperature, respectively. From the [Table 1], it was observed that there was no significant difference in mean age (years) of the subjects between normal and CVD groups. Also, there was no statistically significant difference in HbA 1 C level in both groups. In the diseased group, both the clinically evaluated mean values of Framingham CVD risk score and systolic blood pressure (BP; mmHg) were greater (P < 0.05 and P < 0.01, respectively), compared to its normal counter parts. The analysis of the average surface temperature in various parts of the body was indicated that a greater difference in temperature was observed in foot. The average temperature difference between the groups in upper extremities is about 1%, whereas, the same lower extremities was about 8% with a highest temperature difference of about 9.4% in foot posterior right as shown in [Table 2]. Under normal circumstances, the temperature of the surface of the human body is symmetrical about the anatomical medial axis. 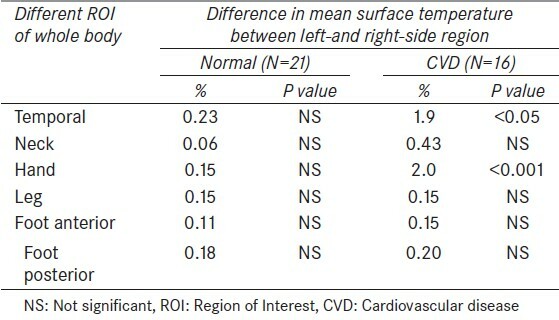 In the normal group, higher symmetrical surface temperatures on both left and right side of upper and lower body regions were observed, when compared to CVD group [Table 3]. On the other hand, in the diseased group, a statistically significant asymmetrical surface temperature difference were observed in hand (2%, P < 0.001) and temporal regions (1%, P < 0.05). HDL (mg/dl) = 8.197 − 3.368*X 1 − 3.124*X 2 + 0.661*X 4 [From step 3, [Table 4]]. TC (mg/dl) = 626.39 − 10.58*X 2 + 46.55*X 1 − 47.24*X 3 [From step 3, [Table 5]]. X 4 - Surface temperature of foot anterior right (°C). Using the obtained regression equations; HDL and TC were predicted for the population studied. Then, paired sample's t-tests were conducted to compare both biochemically measured HDL and TC values with their corresponding predicted values. 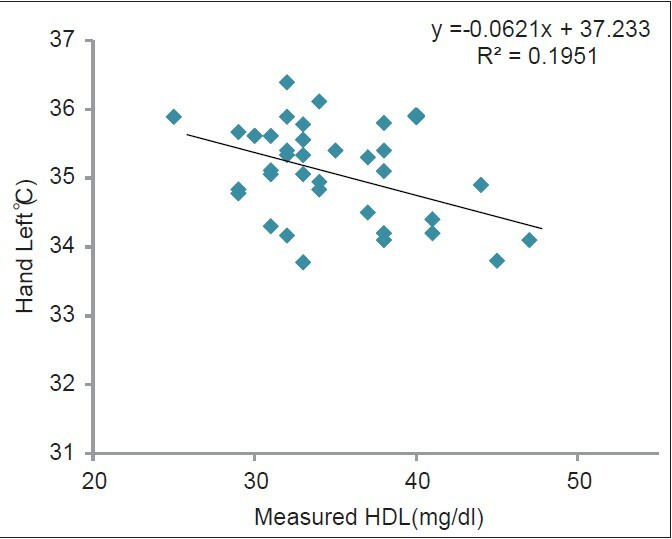 There was no statistically significant difference between the measured and predicted HDL values (t = 2.02, P = 0.54). Similarly, there was no statistically significant difference between the measured and predicted TC values (t = 2.02, P = 0.98). The model gave sensitivity and specificity values as 78 and 81% for HDL and 79 and 83% for TC, respectively. Claudication due to impaired circulation is due to plaque formation. The subclavian artery and brachiocephalic arteries are cited as the most common early site of atherosclerotic lesions in the upper extremity. The lesions tend to alter the blood flow. 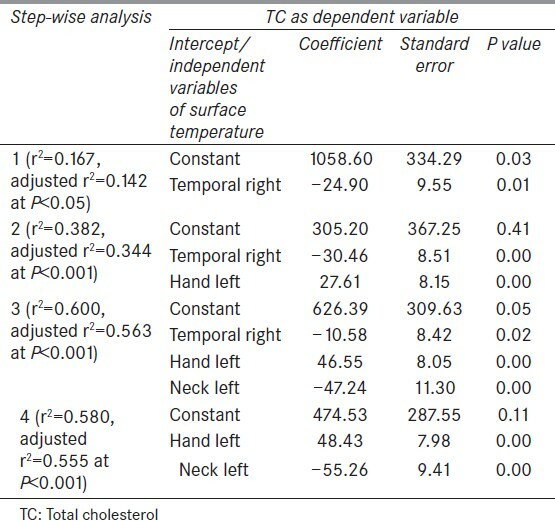 Hence, the difference in correlation of the biomarkers (TC and HDL) with surface temperature of hand and neck between the left and right side confirms the same. Blood pressure asymmetry especially in upper extremity is a common early symptom in clinical examination of atherosclerosis. The pulse asymmetry depends on the extent of degree of stenosis. Blood flow through ulnar artery is a confirmatory test for occlusive diseases of the upper extremity. In a perspective study, Juha et al., have evaluated the surface temperature asymmetry in leg for subjects who were at high risk of peripheral arterial disease. , Vascular asymmetry is clearly depicted in the hand of CVD group with both temperature asymmetry and difference in mean temperature between the normal and CVD group. The extent of vascular stenosis is judged by the examination of lower extremity. Sanjeev et al., have established that if the stenosis is prolonged and not supervised, then the lower extremity blood pressure is a representative of central aortic root pressure. , Compared to ankle brachial pressure index (ABI), the foot pulses from dorsalis pedis and posterior tibial pulses were found to be more accurate in detecting the arterial disease in lower extremity as reported by Armstrong et al. The significant difference in mean temperature in lower extremity, foot anterior and posterior region (8% difference, P < 0.001) was obtained while comparing the normal and CVD group confirms the same. [Figure 3] is a right and left hand of normal subject (age: 52 years) with temperature symmetry. [Figure 4] is hand of CVD subject (age: 55 years) showing temperature asymmetry in the palm region. The upper extremity temperatures especially of hand left also contributes significantly (P < 0.001) to prediction of both TC and HDL as indicated by the regression models. 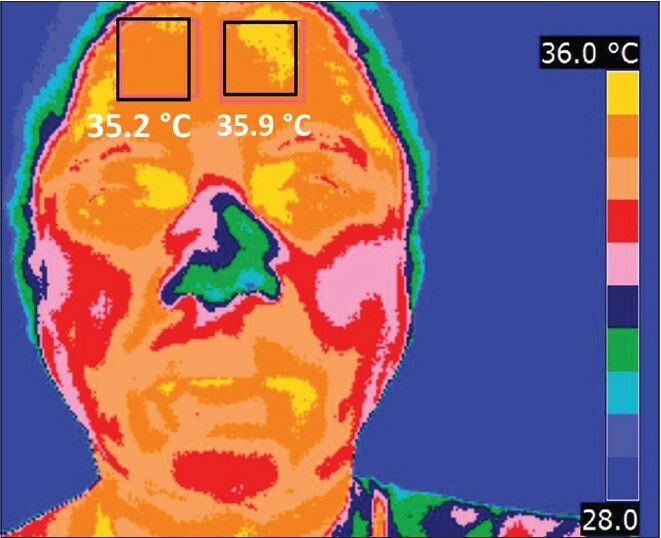 [Figure 5] is face of normal female (age: 45 years) subject showing temperature symmetry. [Figure 6] is a female subject (age: 49 years) whose left temporal region shows high temperature (35.9°C) compared to the right side as indicated within the markers. Several limitations of our study should be mentioned. First, the trial was conducted for a period of a week in the forenoon session to avoid the effect of cyclic variations in the atmospheric temperature. Hence, out of the 150 registered participants, only 80 were recruited for the study. After implementing the appropriate inclusion/exclusion criteria, the study population reduced to 37 subjects. Hence, the trial has to be concluded as pilot study. Second, statistical conclusion could be drawn, but correlation relation between surface temperature and TC/HDL is region-specific, which makes the general surface temperature inconclusive for CVD subjects. Third, confirmatory tests like measurement of ankle/brachial index and biochemical parameters like LDL-cholesterol, triglycerides, urinary protein, and urinary glucose was not done to differentiate atherosclerotic and nonatherosclerotic CVD subjects. Last, the reproducibility of the measurement has to be checked by repeating the imaging session after few days. For the study population selected, the average temperature in various ROI was calculated using the FLIR software. The statistical analysis was performed on the clinical parameters, average temperature measured, and the temperature asymmetry was also analyzed. The key findings of this work are: First, the correlation of the parameters TC and HDL with the sites of commonly affected arteries in the upper and lower extremity. Secondly, mean difference in surface temperatures of lower extremities indicating the presence of stenosis can be a diagnostic criterion apart from the usual ABI method for the diagnosis of peripheral arterial disease. Third, the temperature asymmetry similar to blood pressure asymmetry which is observed in the upper extremity can be an early symptom of arterial occlusive disease. The regression equation formed can be used for predicting the HDL and TC values noninvasively. In a large-scale study, various approaches like static and dynamic IR imaging and advanced image feature extraction techniques with subsequent development of automated computer-aided diagnostic model can be done. This will bring out the potential of thermal imaging for predicting CVD with more sensitivity in a clinical setup. We would like to thank Dr James Pandian, Dean, SRM Medical College Hospital and Research Centre, Kattankulathur, Chennai, India for his clinical advice and IGCAR Kalpakkam, Chennai, India for all their support during the study. 1. Gupta R, Misra A, Pais P, Rastogi P, Gupta VP. Correlation of regional cardiovascular disease mortality in India with lifestyle and nutritional factors. Int J Cardiol 2006;108:291-300. 2. Birtcher KK, Ballantyne CM. Cardiology patient page. Measurement of cholesterol: A patient perspective. Circulation 2004;110:e296-7. 3. Gupta R, Gupta VP, Sarna M, Bhatnagar S, Thanvi J, Sharma V, et al. Prevalence of coronary heart disease and risk factors in an urban Indian population: Jaipur Heart Watch-2. Indian Heart J 2002;54:59-66. 4. Barter P, Gotto AM, LaRosa JC, Maroni J, Szarek M, Grundy SM, et al. Treating to New Targets Investigators. HDL cholesterol, very low level of LDL cholesterol and cardiovascular events. N Engl J Med 2007;357:1301-10. 5. Ring EF. The historical development of thermal imaging in medicine. Rheumatology (Oxford) 2004;43:800-2. 6. Iman K, Oky Dwi N, Rizal R. Pattern recognition to detect breast cancer thermogram images based on fuzzy inference system method. Int J Comput Sci Technol; 2011;2:3:2229-4333. 7. Lin CL. Biometric verification using thermal images of palm-dorsa vein patterns. Circuits and systems for video technology. IEEE Trans 2004:14:2:199-213. 8. Chen YT, Wang MS. Human face recognition using thermal image. J Med Biol Eng 2002;97-102. 9. Deng F, Tang Q, Zheng Y, Zeng G, Zhong N. Infrared thermal imaging as a novel evaluation method for deep vein thrombosis in lower limbs. Med Phys 2012;39:7224-31. 10. Shirizadeh A, Haghipour S, Sakhavati A. Physiology based face recognition in the thermal infrared spectrum. Life Sci J 2013;10:540-5. 11. Madjid M, Naghavi M, Malik BA, Litovsky S, Willerson JT, Casscells W. Thermal detection of vulnerable plaque. Am J Cardiol 2002;90:36L-9. 12. Grubisic I, Gjenero L, Lipic T, Sovic I, Skala T. 4D thermal imaging system for medical applications. Periodicum Biologorum UDC 2011;113:4:407-16. 13. Reinhold B. The medical use of infrared-thermography history and recent applications. Thermografie-Kolloquium 2007;Vortrag 04:1-12. 14. Charkoudian N. Skin blood flow in adult human thermoregulation: How it works, when it does not, and why. Mayo Clin Proc 2003;78:603-12. 15. Ley O, Kim T. Calculation of arterial wall temperature in atherosclerotic arteries: Effect of pulsatile flow, arterial geometry, and plaque structure. Biomed Eng Online 2007;6:8. 16. Yu F, Ai L, Dai W, Rozengurt N, Yu H, Hsiai TK. MEMS thermal sensors to detect changes in heat transfer in the pre-atherosclerotic regions of fat-fed New Zealand white rabbits. Ann Biomed Eng 2011;39:1736-44. 17. Honda Y, Fitzgerald PJ. Frontiers in intravascular imaging technologies. Circulation 2008;117:2024-37 . 18. Pavlidis I, Tsiamyrtzis P, Manohar C, Buddharaju P.Biometrics: Face recognition in Thermal infrared.Biomedical Engineering handbook.CRC Press, 2006:chapter 6. 19. Murabito JM, D'Agostino RB, Silbershatz H, Wilson WF. Intermittent claudication. A risk profile from The Framingham Heart Study. Circulation 1997;96:44-9. 20. Riddell T, Wells S, Jackson R, Lee AW, Crengle S, Bramley D, et al. Performance of Framingham cardiovascular risk scores by ethnic groups in New Zealand: Predict CVD-10. N Z Med J 2010;123:50-61. 21. Ring E, Ammer K. The Technique of Infra red Imaging in Medicine.Thermology Int. 2000;10:7-14. 22. Rubinstein EH, Sessler DI. 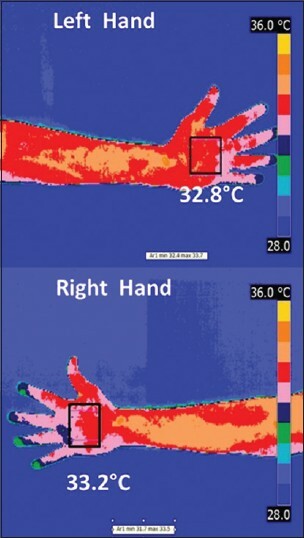 Skin-surface temperature gradients correlates with fingertip blood flow in humans. Anesthesiology 1990;73:541-5. 23. Toth PP. Cardiology patient page. The "good cholesterol": High-density lipoprotein. Circulation 2005;111:e89-91. 24. Faxon DP, Fuster V, Libby P, Beckman JA, Hiatt WR, Thompson RW, et al. American Heart Association. Atherosclerotic Vascular Disease Conference Writing Group III: Pathophysiology. Circulation 2004;109:2617-25. 25. European Stroke Organisation, Tendera M, Aboyans V, Bartelink ML, Baumgartner I, Clément D, Collet JP, et al. ESC Committee for Practice Guidelines. ESC Guidelines on the diagnosis and treatment of peripheral artery disease: Document covering atherosclerotic disease of extracranial carotid and vertebral, mesenteric, renal, upper and lower extremity arteries: The Task Force on the Diagnosis and Treatment of Peripheral Artery Diseases of the European Society of Cardiology (ESC). Eur Heart J 2011;32:2851-906. 27. Huang CL, Wu YW, Hwang CL, Jong YS, Chao CL, Chen WJ, et al. The application of infrared thermography in evaluation of patients at high risk for lower extremity peripheral arterial disease. J Vasc Surg 2011;54:1074-80. 28. Sanjeev PK, Sandeep H, Arthur CW. Problem solving in radiology: Cardiovascular Imaging: Expert Consult - Online. Elsevier Health Sciences; 2012: Chapter 48. 30. Armstrong DW, Tobin C, Matangi MF. The accuracy of the physical examination for the detection of lower extremity peripheral arterial disease. Can J Cardiol 2010;26:e346-50.